· Automatic Return function makes it easy to find the way home. 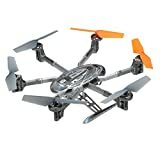 · It has a 6-axis gyroscope which can have a more stable flight and is easy to control. · With Headless Mode, no need to adjust the position of the hexacopter before flying. · LED lights, possible for night flight.